Sam's Falling creates a ..subtle..sonic..lift.. Through Cynthia Hall’s magnificent and haunting voice, we are transported to an ancient, even archetypal, window of the soul. Lifted up and carried along by the sensuousness of her evocative and instructive phrasing, we learn about yielding to the deepest emotions to find the spirit within. Flawlessly balancd and underscored by Pim Bouwens’ delicate instrumentation, exceedingly fine musicianship, and extraordinary arrangements, Cynthia's vocal virtuosity comes often into victory in their newest CD "Simplify". 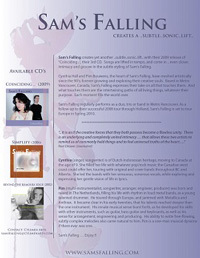 Sam's Falling is Cynthia Hall (singer, songwriter) and Pim Bouwens (multi-instrumentalist, songwriter, arranger, engineer, producer)based in Greater Vancouver, Canada. Their paths crossed in the Netherlands in 1993 and they have since never parted. Their union sparked off incredible explorations, musical and otherwise, resulting in a unique musical presence that is powerful, subtle and comforting.Cynthia, of Dutch-Indonesian heritage, moved to Canada at the age of 9. She filled her life with whatever music the Canadian west coast could offer her, touring with original and cover bands throughout BC and Alberta. She led the bands with her skillful, sonorous vocals, while exploring and expressing her vision of life through her unusual lyrics. Cynthia's musical sense is sympathetic and insightful. Pim, who was born and raised in The Netherlands, filled his life with rhythm in loud metal bands, as a young talented drummer. He toured through Europe, and jammed with Metallica and Anthrax. It became clear in his early twenties that his talents reach deeper than the one instrument. His innate musical sense burst forth, as he developed his skills with other instruments, such as guitar, bass guitar and keyboards, as well as his sense for arrangement, engineering and producing. His ability to write uniquely free-flowing yet subtly complex melodies also came natural to him. Pim is a one-man musical dynamo if there ever was one. As a unit Cynthia and Pim have already performed their music in The Netherlands, Australia, and Canada. That's just a start. Meet Sam's Falling. It is with deep sadness that we have to announce the passing of Cynthia on November 1st 2017, after a battle with cancer. This beautiful soul will stay in our hearts forever. RIP. FOREVER SHELTERED ... Cynthia's new track with Belgian trance-masters: First Effect. So proud of this one !! Have a listen. “Forever SHELTERED”. So wonderful !!! Cynthia's 2nd trance release this year SLAVE TO DOUBT, a collaboration with incredible master-DJ Matt Bukovski from Poland, is ready for release within days on Amsterdam Trance label. Have a listen and enjoy !!! “SLAVE TO DOUBT”. Cynthia's 1st trance track of 2015: MORNING LIGHT. Yesss ... a beautiful uplifting collaboration with master-DJs LAS SALINAS. ENJOY !!! “MORNING LIGHT - Cynthia Hall Music YouTube Channel”. Video EVERYTHING WITHIN, EVERYTHING WITHOUT released on “Cynthia Hall Music YouTube Channel”. Very proud of this song and video !!! Video for EVERYTHING .... in the works. This video will be shown on "Cynthia Hall Music YouTube Channel" within days !!!! Continuing to work on Trance tracks; with upcoming release dates to be published soon. SUNFLOWERS voted #2 Future Favorite for ASOT#674; top DJ, Armin van Buuren's world-renowned weekly trance radio show. "SUNFLOWERS", my newest Trance track, this time with mastermind A.R.D.I., is out TODAY !!! Listen in "Trance audio" below. ENJOY !!! Working on Sam’s Falling video. “Step Towards The Within” (CH & DJ Yura Moonlight & DJ Dart Rayne) reaches #13 on BeatPortTranceTop100; #1 on BeatPortMustHearTranceTrack of Week 23.